The U.S. economy disappointed market expectations by adding only 160,000 jobs, the lowest number since September 2015. The private sector hired 171,000, meaning government entities shed 11,000 workers. 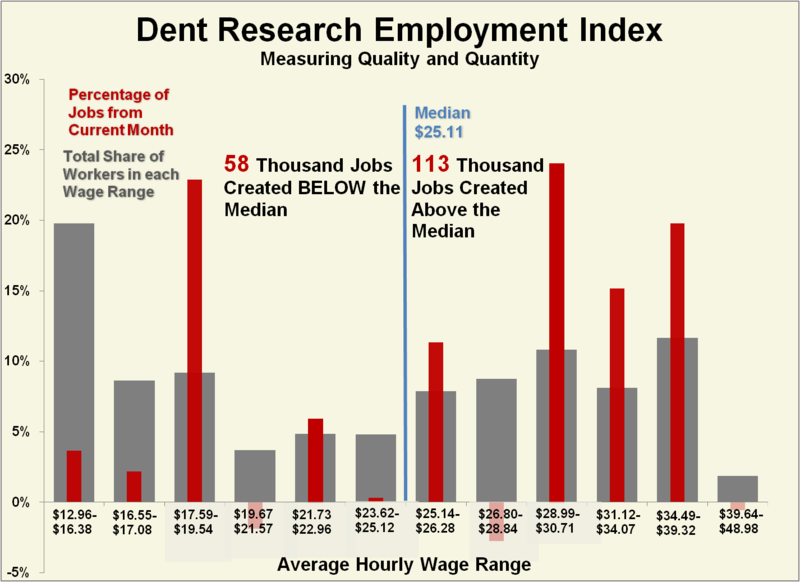 Although April was a clear slowdown in hiring, Dent Research finds that most of the job additions went to well-paying industries. In fact, nearly two-thirds of new jobs rose above our measured median wage. The economy bucked the long-running trend of hiring at the lowest wage scale, contributing to just 3.6% of April’s hires. For now, at least, the economy has had its fill of retail workers. Professional and technical services were the biggest winner of the month, adding over 31,000 jobs. These high-skill industries pay just under $40 per hour, ninth highest of the 84 major industries we study. Despite the good news in high-wage markets, the stubborn U-shaped trend of middle-wage jobs lagging behind refuses to break. The middle third saw just 15% of the job additions.